As previously described, Siren's characters were created from a "photo-realistc" method using textures created from photographs. Touched by the curse of Hanuda Village their faces contorted with fear, screaming, were also recreated based on photos. 09 & 10 - Taking photos to capture the changing expressions of the actors. 11 & 12 - By creating textures based on the photos of their faces, the CG characters are able to look this realistic. 13 & 14 & 15 - The process of applying the textures created from photo data to the faces of the 3D models. 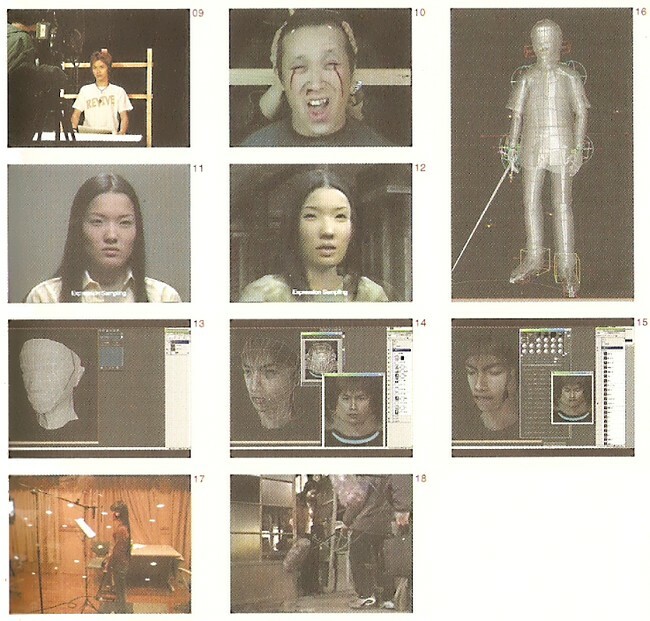 16 - From their clothing to their face, each part of the 3D models have textures applied to them. 17 & 18 - Voice recording. Sound effects were also recorded by recreating the noises. Siren's characters were created by applying textures created from photo data. The same method was employed to reproduce the various facial expressions seen on them. Unlike things like creases in their clothing, to record the data to an even higher level of precision their facial expressions were photographed separately from their costumes and movement. For the characters who appear in the Other World version of Hanuda Village alone, many different expressions were required. Contorted in fear, screaming, feeling relieved, fighting the grief of parting... Each of those assembled were professional actors, and their performances are true to life. However, unlike traditional acting, the movement of their entire body and their facial performances were combined for Siren, which seems to have been quite tough for them. As you can see by looking at the photos, when their faces were being captured for use as textures their faces were held completely still to avoid even the slightest movement in the data. Fear, happiness, sadness... These emotions had to be shown on their faces with absolutely no physical movement, which seems like a tough task even for a group of professionals such as themselves. Incidentally, with standard CG, since the face is symmetrical often only half of the face is captured and joined together; for this game, however, the whole face was recorded as a single texture. Naturally the total amount of data recorded was huge, but art director Mr. Takahashi says, "It was a compromise we were prepared to make in order to produce that realism we were aiming for in terms of textures." Paying this amount of attention to the fine details of the facial expressions, when including the character voices throughout the game, they are just like the actors themselves. Furthermore, the sound effects in the gae like the sound of doors opening and closing and footsteps were all basically recorded at an abandoned house the team visited.